If you grew up like me, only tasting beets from a can, you probably didn’t get super excited about eating them. 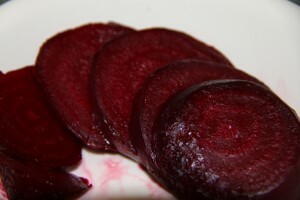 In fact, as a kid who liked my veggies, beets were the only one I simply wouldn’t eat. It wasn’t until I talked with a local chef about baking them about a year ago, and tried the easy recipe below, that I really began to appreciate their earthy, sweet taste. Hubby loves them, even from a can. But he even admits they are MUCH tastier baked. Later, I learned the leaves were good to eat too. They taste a lot like spinach. So while preparing the fresh bunch I bought at the farmers market yesterday, I decided that if the leaves were good, the stems must be edible too. Sure enough! They are similar to celery. 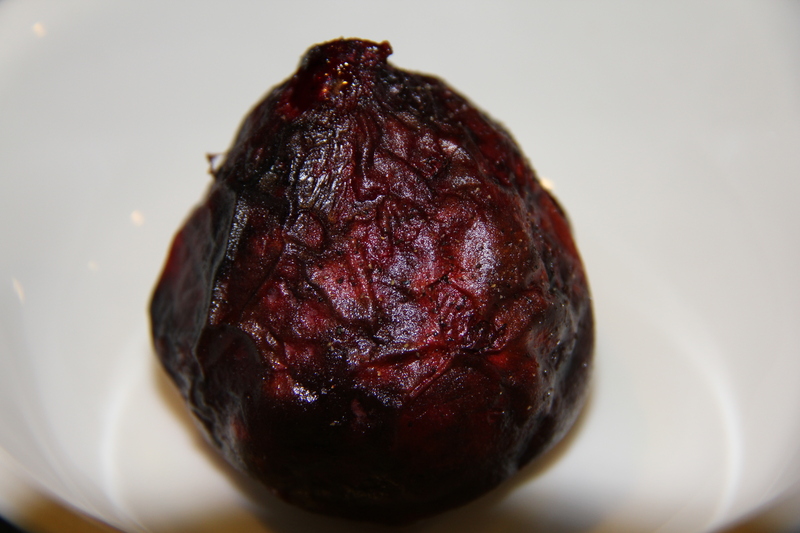 So below are three beet-tastic and easy recipes to utilize the entire beet – except for the tiny root, which, I’m gonna guess, is also edible and probably could be baked along with the larger root. Zilch for the compost pile and lots of goodness for your tastbuds. Let beets cool. Skin will peel off easily. Slice and serve or slice and cool to enjoy in a salad later. Wash thoroughly and chop green from stem. (Save stem for recipe below.) Place in a frying pan with a drizzle of sesame oil, sea salt and pepper. 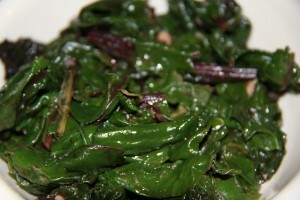 Cook at medium heat, stirring occasionally until beet greens are a bright green. (about 10 minutes). Do not overcook. Squeeze lemon juice and stir. Serve. 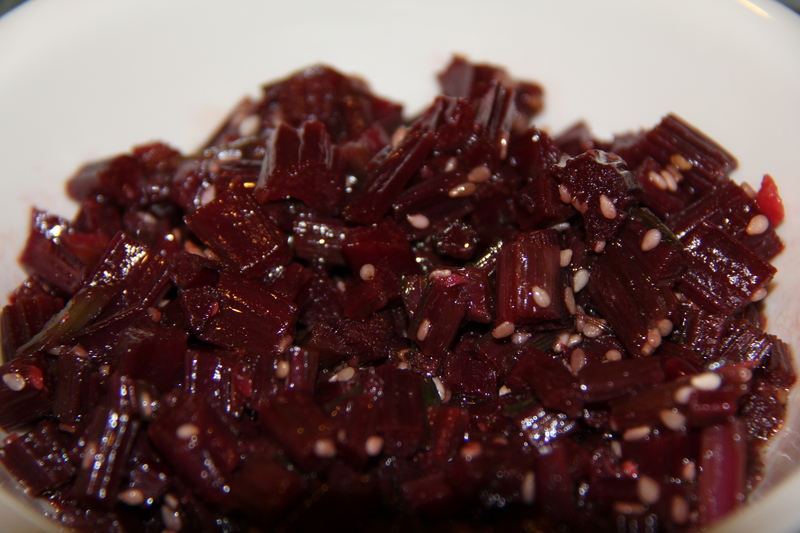 Chop beet stems into small 1/4 inch slices. Combine with oil and salt. Cook at high heat for 3 – 5 minutes, stirring. Lower heat to low-medium, cover and simmer for 15 minutes or until soft. Add Dr. Bragg’s and sesame seeds. Stir and serve or chill and add to salads later. This entry was posted in Recipes, side dishes and tagged beets, cooking vegetables, vegan recipes, veggies. Bookmark the permalink. Damn! I went to the Boulder Farmers Market on Saturday and bought gorgeous beets, red, yellow and orange. Baked them last night, delicious! but I threw out the leaves and stems! Who knew? well, now I do. Too bad I didn’t see your blog first! They are really good JoAnne! Glad you found the post so you can enjoy them next time. I too have always had beets from a can. I will try this since it seems so easy to make.